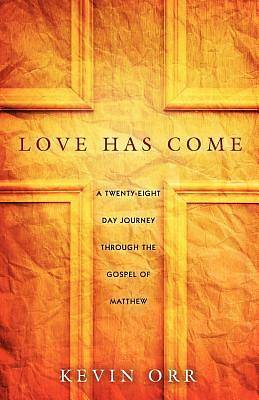 Love Has Come is a twenty-eight day devotional study of Matthew's gospel that explores Jesus' motivation for coming to earth, living among men and women, and dying on Calvary's cross. That motivation was love for a lost and dying creation-a love for you. Each day focuses on one chapter, one verse, and one theme in the book of Matthew. The themes include faith, trust, love, and conflict and are brought to life by personal testimonies that will help you consider Matthew in a fresh and meaningful way. The introspective observations will inspire you to dig deeper into God's Word and rediscover the greatness of Jesus. Each day also includes a challenge to help you examine your thoughts, actions, and motivations in light of Jesus' life as observed in Matthew.